You are here:Home Tips What is stage fright? In this two-part blog series we are discussing what is stage fright, and how to overcome it. This first part is about identifying what is stage fright, and what’s happening to your body when you experience it. The second part will discuss some ways to overcome it for good! So the first thing we need to do is identify what stage fright is? You know that feeling you get before standing in front of an audience? The one where you get butterflies in your tummy, you get all nervous and start worrying about things that could potentially go wrong? That’s stage fright, also known as performance anxiety. It can happen at any time you’re performing in front of people; playing a gig, performing your solo, or speaking in a meeting at work. It affects all of us differently; some people are adept at ignoring this feeling and can just go out and do their thing, but some of us struggle with the negative fears it creates. 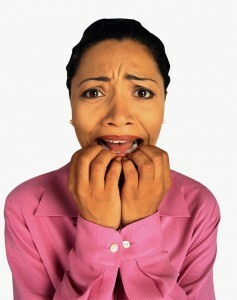 Stage fright at its basic level is your body’s fight or flight response to a stressful situation. Amongst other things, you get a sudden surge of adrenaline, because your brain has perceived the performance situation as potentially harmful. Your brain is trying to process this fear, and as a result is causing your body to be ready to stay and fight, or flee from the circumstances surrounding you. This comes from our cave-man days – when Neolithic Man was faced by a sabre-tooth tiger it triggered within him a fight or flight response. Namely, was he going to stay and fight the tiger and potentially die in the attempt, or was he just going to run away? His brain was trying to weigh up the pros and cons of having meat and fur for his family, or running away and staying alive, hence the term ‘Fight or Flight’. Okay, but what does that have to do with performing? There are, of course, many others to add to this list, but these are the most common ones. But the question is, “Why”? Why do those specific reactions happen in situations like these? We know there isn’t a sabre-tooth tiger chasing us, and we’ve evolved so far from our Neolithic ancestors that we shouldn’t need to feel this way! It’s only a short performance or speech we’re making, we aren’t fighting a large cat for our lives any more. But, since your brain is perceiving the same stress levels in the present time as it did when we were living in caves, it thinks the body is under attack. Those feelings you get are several different responses the brain puts into action to keep itself and the body alive…..
A dry mouth, nausea or the feeling of a heavy lump in your stomach area, are by-products of your brain shutting down your digestive system. Saliva production ceases, and any leftover food just sits in your digestive system waiting to be processed. This is all because the brain has decided that food processing is unimportant in this time of unusual stress – we don’t want to be using up precious energy on something that is way down at the bottom of the priority list! Your brain is trying to protect your vital organs, causing the muscles to contract around them. Shaking and trembling limbs, especially your hands, are caused by you fighting that action so you can keep control over your body. Our brains are conditioned to protect us, and this is one of the ways it knows how to do so. Hyperventilating and excessive sweating are both by-products of an increase in blood pressure. The brain is trying to increase the amount of oxygen in the body by making you take lots of shallow breaths (hyperventilating) and getting it around the body as fast as possible. Excessive sweating is an unfortunate side-effect of increased blood pressure; your body is trying not to overheat, but also to maintain the work of the two most vital organs – the heart and the lungs. The most common effect of stage fright is the butterflies in the stomach. This is caused by an increase in adrenaline pumping through your body, priming your muscles to either fight or flee the situation. The brain responds to this as well, causing the lightning quick reactions and babbling nonsense we all associate with stage fright. Well, that is the question. Your body is primed for both actions; either to run away quickly or to fight that tiger to the best of your ability. Our Neolithic ancestors were responding to a very physical danger; when faced with a sabre-tooth tiger it all came down to survival of the fittest. Our brains evolved wonderfully to ensure we were at the top of the food-chain, and the Fight or Flight response was the solution to this. But, we aren’t facing a physical danger when we perform; it’s a perceived danger arising from the fear of failure. Our brains are associating this situation as the modern-day sabre-tooth tiger, so it naturally wants to defend us from the danger, which causes us to experience stage fright or performance anxiety. But, how can we learn to control these reactions? We’ve worked so hard to learn that song and get it perfect, it would be a shame to let our brains think we’re ready to flee the situation! So there you have it – what is stage fright and why does it happen? Tune in for part two of this blog series, “How to Overcome Stage Fright”. It has lots of tips and ideas, whether you are preparing for a performance in the next few minutes, or in the next few months.